That looks fantastic. I'm sure I've seen a video where the scrolling corruption doesn't occur, so is that something that happened since? But it all looks pretty much done. You have all the main stages. Surely a bit of bug fixing and a title screen and you're done?! I'm sure there's more to it than that though. Still it looks brilliant. The long trails down the screen are from some other changes, including the bit where all the large birds swoop down rapidly off the bottom and then come back on the top. Ahh I see. You seem to have done soooo much. Don't give up now. It looks awesome. It looks very fine. I want to find time to play it. It reminds me my favorite https://www.youtube.com/watch?v=RPbmLWz31rE. I am still and maybe forever the champion there - see Hall of fame - http://plus4world.powweb.com/software/Xargon_Wars - younger me made more than 30 levels with real iron. BTW Commodore+4 hardware is close to beeb. It uses the slower 6502 (at 1.15 MHz), no sprites, 2 channels sound. This game doesn't use the horizontal scrolling and occupies less than 14 KB RAM. So it maybe relatively easy converted even to BBC Micro A. Sounds like it world also work well on the electron. I know the plus4 didn't get a lot of games, but maybe there are some good porting opportunities back and forth. The sources are released this year http://agremlinintheworks.co.uk/archive ... -Disks.zip. However Commodore+4 uses character base graphics - it may create the difficulties for the conversion. Will there be a special woodgrain edition? I was raised on the Atari 2600 version, which seems faster. Yet this has way more in it and is extremely slick. Classic home arcade isn't classic home arcade until some authentic Atari-style woodgrain is the definitive finish. Certainly better than the Commodore 64 version. Phoenix uses two character based layers, one can scroll vertically. Carnival is a single character based screen, no scrolling, so pretty much any system should be able to do a good job. OK, despite being ill for most of the holidays, I have made a couple of fixes to Phoenix. Controls Z,X (left and Right) RETURN (fire) and SHIFT (complete level - will be shield). If anyone has suggestions for other stuff, please chip in. Edit: i won't be fixing the flickering as it is just too big a rewrite. Last edited by tricky on Thu Jan 05, 2017 5:35 pm, edited 1 time in total. I have spent a bit of time this week, while I should have been playing Frogger, and added the shield along with a few off the list. The shield doesn't actually protect you yet, it just stops you moving and firing, but does have a re-charge time (not reset at level end) and is activated by fire as I am still using shift. There is still a bit of tidying to do, but I think the only bug with the shield is the occasional trail on the boss level. I'm now down to 961 bytes of code/data space left, which should be enough for lives, games, collisions and maybe the player explosion. Thanks for these updates, it's coming together nicely! Last edited by leenew on Fri Jan 06, 2017 10:27 am, edited 1 time in total. Hi Tricky, just downloaded Phoenix for my first play on it. I thought I'd have a few games of Eagle Empire first to compare but it kept crashing! I seem to recall the original beeb version crashed occasionally but on the beebem version it is pretty much unplayable. The graphics and sound are brilliant by the way but one notable issue is the shields activate quite a lot on firing. I'm currently using FIRE to trigger the shield as I am using SHIELD for skipping levels for testing . The previous version doesn't have shield, so that is better if you actually want to get a feel for the game play, especially as the shield currently offers no protection and just stops you from firing and moving. These previews are really for feedback on improvements before I get too close to finishing. My game has horrible flicker, but as it would be a rewrite of all the sprite routines to fix it, we're stuck with it (actually the original has quite a bit too). Just had a few more games and managed to blast the boss ship! The arcade version of the Phoenix boss level is a lot harder because the ships come down to attack you straightaway (this isn't a recommendation by the way). I'm not sure how tricky it would be to do but on the arcade version I like seeing the planets in the background starscape and also the fact that the background scrolls. The diving birds get more aggressive as you get past more levels but the birds fire more, balancing it out a bit. The arcade game has two independent hardware layers, so the stars are my compromise (you do get 7 colours per scan line in mode 1 ). To have scrolling planets, I would need to rewrite all of the drawing code and each bird would cost roughly six times more to draw which would make everything much more complicated and I would run out of memory. Whilst I do like to get as close to the original game as possible, especially as I loved Phoenix BITD, there have to be more compromises the more features the original hardware had. Write one byte per character and the hardware does the rest. 32Kb - 16.5KB for the display (so I have to squeeze 26Kb into 15.5Kb. If the game feels like the original and is technically impressive I'll be happy (not as happy as if it was identical ). I'm looking forward to your next release. Good luck. This looks amazing. Good work! 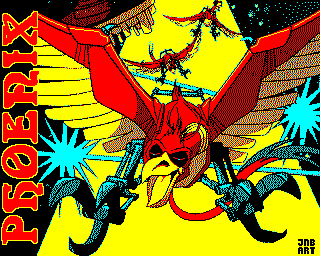 Phoenix was always one of my favourite arcade games, and I had Alligata's Eagle Empire for my Beeb. I'm about to try and get my Model B up and running for the first time since the 80s, so I look forward to running the finished version of this someday! Finally, here is the first beta of what is now a playable game. There is still some tidying up to do, but everything is in and I still have 92 bytes left for luxuries. Since I added displaying the bonus for killing the boss, I haven't managed it, so it may not work properly! Z,X left and right, RETURN fire (and start new game) and SHIFT shield. tricky wrote: Finally, here is the first beta of what is now a playable game. That brings back some scary memories! Boy am I terrible at this game, but wow is it good! I seem to have made it much harder with the last few tweaks! Please list any issues with the game, as I don't know how many times I will be coming back to it now. To code that is, it is still one of my favourite games. Last edited by tricky on Mon May 29, 2017 11:12 am, edited 1 time in total. The amount going on, the speed and the size of the sprites together make this another remarkable game. I'm utterly useless at it but it's very, very impressive to play. I love the feeling of flight you get from the small birds, and how much gameplay there is to this game. I'm more of a puzzle game type person, but I really enjoyed this. Well done Tricky! Here is another update with a few fixes including the boss level failing to stop when there are "diving" birds in flight. I still need to add joystick support and there are a couple of bits to tidy up. As I have said many times, it will never be how I wanted it, but I do believe that it is worth having. Very tough to play but really well done.